Labour leadership candidate Ed Miliband has joined his more improbable rival Ed Balls in backing a National Union of Students campaign that seeks to replace Labour’s tuition fees policy with a 20 year graduated graduate supplement on income tax. If adopted and supported by a future Labour government this would be a highly retrograd step, moving Labour back towards the economics of punitive socialism and away from the economically liberal centre-ground. Graduate taxes per se are not automatically an entirely awful proposal. If proportional and used as a mechanism of loan repayment, i.e. the actual cost of your tuition, there is little difference between them and the current loans for fees. In that context the argument is about which system is more efficient to administer, and how you maintain university funding in the transition between them. The difference is so slight that most people consider it not worth bothering. That though is not the NUS/Miliband proposal. They instead would seek to impose a unknowable future cost of education on students based on future earnings. Their proposal is an attack on aspiration and success. These graduate taxes create perverse incentives. If for example you are bright, ambitious and want to work in medicine you have a fair expectation you will be in the top quintile for wage earners very soon after university. For you the grad tax is very likely to be much more expensive than fees and loans today. You would be wise then to consider study outside England. And that doesn’t just mean going to the US or mainland Europe. An England-only grad-tax would create incentives for a massive boom in elite education in Scotland, Wales, and Northern Ireland. Labour’s scheme would incentivise a flight of self-assured, self-financed talent from English universities. That talent would then pay less for their education than late developers, or those with few resources up front. Hardly a progressive outcome, nor one good for the English economy and universities. Worse, after university the scheme incentivises working abroad for twenty years out of the reach of the Revenue. The NUS have entirely failed to model the impact of tax avoidance on their scheme. It also begs the question why a bright American should be able to go to Oxford at cost via loans, then work in the UK without a tax bill whilst a native is denied that option. Surely this is discrimination? But if you address that by making the scheme an option versus real cost loans, rates at the bottom would need to be raised or the scheme would fail to finance universities. Either way, unless the NUS are proposing to put a wall around England the price and market for university education will still exist, it will just be denied to the English. At the other end of the scale, those with limited income expectations either through lack of ability or an ambition to work in low paid employment, are incentivised. Their demand for university education would go up. Ed Miliband’splanwould then unwittingly create comparative advantage for the English university sector in providing mickey mouse degrees to marginal candidates. And this the man that until recently was leading plans to encourage UK green-tech through building the science base. Good luck with that when the engineers are studying in Germany, and Cambridge is leading the world in homeopathy. In the middle throughout the 20 year life of the ‘loan’ the bands in the tax would create small disincentives through high marginal tax rates. In recessions people might find themselves paying a higher graduate tax if their wages fall less than the average. It’s a crazily complex system, and this is before arguments about credit-based allocations of cost, employer contributions, and what counts as qualifying education as opposed to vocational training. The advantage of fees, other than transparency and simplicity is that they encourage people to seriously consider the value of higher education. It is precisely that cold market-discipline that enrages the left. They believe those capable of going to university are incapable of making a financial judgement no more complex than taking out a mortgage. Or rather the NUS think students shouldn’t have to think. Patronising, authoritarian and quaint, but somewhat self-defeating in an education system. Their main worry, worth considering, is that some people who might be capable of benefiting from university choose not to due to their fear of debt. This is not an empty worry. Financial risk-aversion is more prevalent amonst thosefrom lower income backgrounds and at the margins can mean able children choose not to go to university. But this is an education not system issue, and one that can be narrowly targeted at the small group in question for very little cost. We need to ensure people have the tools to make sensible investment decisions by the time they leave school, not continue to treat them like children throughout their lifetimes. Particularly not potential graduates. Making an entire system, overwhelming used by those that can afford to pay free at the point of use to combat a marginal disincentive at the margins is ridiculous and wasteful. A criticism that applies equally to the Liberal Democrat’s current opposition to any fees or repayment at all. The NUS has always been a clique of trainee Labour politicians unrepresentative of either student or public opinion. If this is the kind of interest group Ed Miliband feels will help win him the Leadership of the Labour Party you must wonder just how far left they have gone and will continue to drift during this Parliament. It can only bode well for the longevity of the Coalition. The above graph from the Appendix A of the Budget shows the actual material impact of all measures on each income decile by 2012/13. It has not appeared on the left-wing blogs currently claiming the Budget is highly regressive. Instead they use this one from the Institute for Fiscal Studies. Even in that graph though does not support their arguments. What we can clearly see is that from decile 2 to 9 the effect of changes are broadly progressive or proportional. From 9 to 10 highly progressive, and only from 1 to 2 slightly regressive. This one difference is from where all this week’s attacks on coalition ‘progressive’ claims have stemmed. However as we can see from the first graph, the actual cash impact of the changes is about £25-50 a year between those on £14,000 and those on less. Does anyone, even in the Social Liberal forum, sincerely believe that this £25-50 a year represents a great injustice that condemns the entire Budget? At the other end those on £50,000 or more will be paying an average of £1,000 a year more than those around £38,000, or £1,650 a year in total. This disproportionate assault on a minority apparently is ‘fair’ to the left, yet has gone largely unnoticed by Liberal Democrat malcontents. 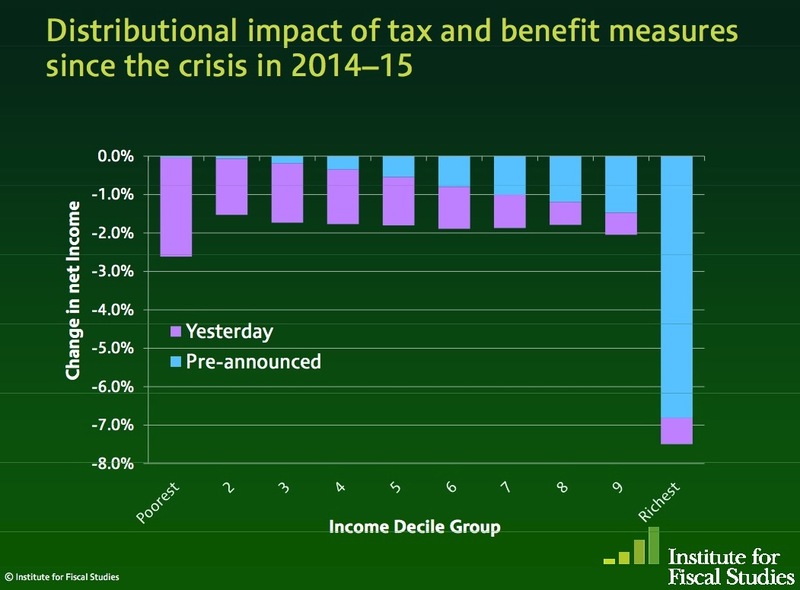 One response to that analysis has been that the Budget graph goes up to 2012/13 not 2014/15 where the IFS indicate more welfare reductions kick in. However actually looking at that analysis, the difference between 2012 and 2014 looks like a reduction of about 0.4% of income (-2.2% to -2.6%), or another £10-£20 for the bottom decile, with similar reductions across the board up to decile 9. For the top decile the increase is a near doubling of their loss from -3.9% to -7.5% or around £3,000 on average, for many then considerably more. That this goes unnoticed speaks to Tuesday’s point that the distributionalists are group who will never be satisfied. The other point of attack is that to be progressive the Budget depends on previously introduced measures not yet implemented, for example the 50% tax rate. There is something in that, however it is the case that the Coalition could have reversed those measures. It is the Coalition, not Labour implementing the changes. From bottom to top the facts show the impact of changes this Government will introduce are progressive, just not uniformly for every group. Liberal Democrats of any stripe should not find it difficult to rebutt this dishonest attack. Or better still ignore it, most normal people don’t base their happiness or political decisions on the percentile differences between their loss and someoneelse. It’s the actual loss that matters and in that regard a lot more people on high incomes will have a reason to resent this government by 2015 than those on benefits. Labour bloggers at Left Foot Forward have written a thorough post with their take on the distributional impacts of today’s Budget. They make a case that in percentile terms the Budget is marginally more regressive than progressive. Nick Clegg conversely has written to Liberal Democrat party highlighting how the budget lays the foundations for a “fairer society”. What is gripping about both articles though is… not a lot. The main issue with distribution rhetoric is that it very hard to relate any sense of good, bad, right or wrong to the shape of the Lorenz curve, an economists tool for assessing income distribution, and the associated language of progress and fairness. Equality of income does not tell us whether a society is fair or not. You can have a highly equal society with very little political freedom, and all high tax and spending systems limit your options to choose the good life for yourself. The quality of political decisions for the long-term cannot be judged coherently on micro-shifts in percentages of averages applied to collectivised deciles today. Left Foot Forward for example have made a great deal of noise about the fact that raising income tax thresholds does not immediately help the poorest in society. This is self-evident, the very poorest in society don’t have an income, they live on benefits. But what does that tell us? In substance all it tells us that for LFF it is a better world if more people live on benefits than if they work. They want to entrench poverty. A nonsense position in direct contradiction to the aspirations of the Labour movement to create full employment. For distributionalists like LFF and in the Liberal Democrats the Social Liberal Forum, it matters not whether gaps between benefits and jobs encourage people to work, or whether allowing people to keep more money they earn, or from investing what they earn, creates more jobs. All that matters is the Lorenz curve looks as straight as possible. Or at least it matters inconsistently. LFF ‘s negative reaction to the decision to cut an £80m loan to a private nuclear business in Sheffield that would have cost £450,000 per potential job created, on Monday, suggests their progressive principles are disposable when other sectional Labour interests are at stake. The Social Liberal Forum believes the poor should subsidise the children of middle-income parents through university. In that respect the Clegg missive is more instructive, looking at the actual impact of the budget on real people. Low-income workers for example will take home more of what they earn. But it is all still couched in language that implies there is some end goal in sight where society will be fair. What a fair society is for most people has very little to do with the Lorenz curve and much to do with their own subjective perspective of what is fair to them. Income distribution can be an indicator that something is very wrong; in Saudi Arabia for example where a tiny elite control most resources, and restrict the life chances of the rest through authoritarian control mechanisms. But the marginal 2% difference between what the bottom and top 20% of UK society pay in tax (ignoring benefits) tells us little, other than, in that case, that booze and fag taxes disproportionately impact the poor (without that it’s about the same). There are elements of society that are brutally unfair, that can be tackled, stamp duty for example penalises those wanting to get onto the housing ladder, and the mobile, to the benefit of those with homes staying put. There are elements that seem unfair and cannot; smart healthy caring parents will more likely (but will not automatically) have smart healthy well-adjusted kids, whatever you do to the education and social support systems. Excellence and success often requires talent, not just a great work ethic and attitude. And there are many things where it depends entirely where you are standing. The abolition of a flat rate of CGT and replacement with a 28% rate on higher income earners is either progressive social justice or an imprudent imposition on success that will encourage poverty by dissuading investment, depending on your point of view. But all these matters are best addressed by understanding them discretely and considering the real impact of change on real people, not distributionalist tinkering. Political debates on the basis of who is the most progressive leave most of the public cold. Nor are distributionalists a factional interest that can ever be satisfied. Child poverty as currently defined, for example, will never be ‘abolished’ ; and if it were, the campaign group would simply change the definition to an ever higher percentage. The Budget in that regard should be welcomed. In the main it does more good than harm, and the outcome over time should be to put the economy in a better shape for job creation, aspiration, and future growth. That matters. The immediate micro-distributional impacts around it are a footnote not the story. The distributionalists should be ignored. The Liberal Democrats called it The Freedom Bill. The Tories called it The Great Repeal Bill. But the essence is the same. The over-mighty state has replaced our free society with one where personal liberty is curtailed and our ability to pursue our (enlightened) self-interest is inhibited. We need to sweep away the legislative and bureaucratic red tape and free ourselves to be the best we can. Stirring stuff, but is it true? And just how far do the Tories and the Lib Dems really agree on why the bill is needed what it should seek to repeal? The original Liberal Democrat proposal included a 2,000 word draft Bill. Though they did consult at the time, the draft bill does (perhaps unwittingly) convey a sense that the decision as to the content has already been taken. In that respect one must say that the Conservative proposal did represent a more honest consultation – though that may simply be because it came from two backbenchers rather than the party leadership. In practice, however, one has to wonder just how genuine this exercise will be. Please don’t misunderstand! I do not think for one moment that our new Ministers are consciously planning to provide us with a sham consultation. But do you really think that in practice they will approach this exercise with an open mind? For one thing, there are clearly areas of legislation that they would not even give a moment’s thought to abolishing. The National Health Service Act? The Income Tax Act? The Bank of England Act? Okay, those might seem like extreme suggestions, and they would be unlikely to carry much support in the country, but the point remains that it is incredible to believe that the government will really consider any suggestion that the public makes. (And is it really so unfeasible that a movement might arise that wanted the abolition of Income Tax?). So let’s take some more mundane suggestions. The bans on fox hunting and smoking in “public” (actually private) places are both examples of meddling legislation that seeks to ban practices based on legislators’ views of the ends that people should pursue. Whether or not you agree with either or both law, they would fit neatly under the rubric of Clegg’s “encroaching centralisation” that has led to “citizens’ rights [being] eroded by the quiet proliferation of laws”. Yet I can’t see the government abolishing either. And even if there were no “Red Lines”: who will decide which suggestions will be enacted? Will it go to a vote? That would certainly fit with the Conservative’s enthusiasm for “Citizen’s initiatives”, but it seems unlikely that our political masters would accept the will of the mob so quiescently. After all, the Human Rights Act – an assault on which has already been declared a resigning issue by at least two government (including one Cabinet) ministers – is hardly popular with the tabloid-reading masses. Yet if, instead of some sort of referendum, the proposals have to be considered by some “expert panel” of the Great and the Good, it begins to look remarkably like it is the elite, and not the people, that will decide what is to be repealed. This brings us on to a second question: just how united is the vision behind the bill? At first glance, all looks well: Nick Clegg said, in his speech of 19 May 2010, that “encroaching centralisation” has led to “citizens’ rights [being] eroded by the quiet proliferation of laws”; Conservative MP Douglas Carswell wrote that “Laws, regulation and red tape stifle individuals, infantilise communities and strangle enterprise”; Chris Huhne suggested that Labour’s legislative programme has represented “the slow death by a thousand cuts of our hard-won British liberties”. But a second glance reveals differences – not only between, but even within, parties. For some, the act is about civil liberties and human rights. It is about the abolition of the “Database State” and the power of police officers to shake down anyone they choose. But to others, it is as much about freeing businesses from stifling regulation and removing the absurd burdens that legislation places on daily life (It is, notes the quiz that accompanies the Freedom Bill proposal, illegal to import brazil nuts from Brazil, bring potatoes over from Poland or to sell a grey squirrel). Both parties in fact have plenty of new regulations planned with which to disrupt individuals and businesses, from bans on airbrushing to minimum prices for alcohol. In practice, the political elite represented in both parties share one thing in common with their ex-Ministerial Labour foes: a belief that they know what is best for society and that – having won the election – they have the right to impose their will upon the citizen. In practice, therefore – Great Repeal Act or no Great Repeal Act – I suspect that we will see plenty of new legislation in the economic and social sphere, even if our civil liberties may be strengthened in the short term.